The President of the Hellenic Republic (Greek: Πρόεδρος της Ελληνικής Δημοκρατίας, Próedros ti̱s Elli̱nikí̱s Di̱mokratías), colloquially referred to in English as the President of Greece, is the head of state of Greece. The President is elected by the Hellenic Parliament, and his role is mostly ceremonial since the 1986 constitutional reform. The office was formally established by the Constitution of Greece in 1975, but has antecedents in the Second Hellenic Republic of 1924–1935 and the republic established by the Greek military junta in 1973–1974. The incumbent, since 2015, is Prokopis Pavlopoulos, serving his first term in office. The president is the nominal commander-in-chief of the Greek Armed Forces and occupies the first place in the country's order of precedence. Although the Greek Constitution of 1974 vested him with considerable powers on paper, in practice the president took a largely ceremonial role; the Prime Minister of Greece is the active chief executive of the Greek government and the country's leading political figure. The president's role was formally brought into line with actual practice by the 1986 constitutional amendment, which reduced his official powers. According to Article 32 the Greek Constitution, the President is elected for a five-year term by the Hellenic Parliament in a special session at least a month before the incumbent's term expires. Voting takes place in two phases, each maximally of three ballots, separated by no more than five days. The first and second ballots require a supermajority of 200 out of the 300-strong body, dropping to 180 on the third. In the event of a non-election even after the third ballot, the parliament is to be dissolved and a snap election to be called within ten days. After the new parliament convenes, the second phase begins, with the required majority at 180 votes in the fourth ballot and a simple majority of 151 votes in the fifth ballot. The sixth and last ballot is then contested between the two candidates with the most votes and decided by a relative majority. 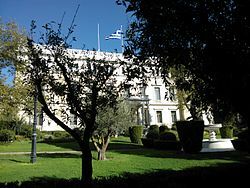 The official residence of the President of Greece is the Presidential Mansion, formerly the New Royal Palace, in central Athens. The current Third Hellenic Republic (Greek: Γʹ Ελληνική Δημοκρατία) was established in 1974 during the period of metapolitefsi, after the end of the Regime of the Colonels which had controlled Greece since the coup d'état of 21 April 1967. On 1 June 1973 the then leader of the military junta and regent for the exiled King Constantine II, Georgios Papadopoulos, abolished the Greek monarchy and proclaimed himself President of the Republic. A staged referendum on 29 July 1973 confirmed the regime change, and passed a new constitution which established a presidential republic. This attempt at controlled democratization was ended by Brigadier Dimitrios Ioannidis' overthrow of Papadopoulos in November 1973. The republic and its institutions were formally maintained, but was nothing more than a façade for the military regime. Lt. General Phaedon Gizikis was appointed President of the Republic, but power was in the hands of Ioannidis, who ruled behind the scenes. After the fall of the junta and the return to civilian rule under Konstantinos Karamanlis in August 1974, the legal and constitutional acts of the military regime were deemed invalid, and a new referendum was held on 8 December 1974, which confirmed the abolition of the monarchy. In the interim, Gizikis, remained in office as President. After the plebiscite, he was succeeded by the first elected President, Michail Stasinopoulos. A new constitution, promulgated on 11 June 1975, declared Greece a presidential parliamentary democracy (or republic – the Greek δημοκρατία can be translated both ways). This constitution, revised in 1985, 2001, and 2008, is still in force today. Writer and jurist, former President of the Council of State. Supported by New Democracy, he was elected unopposed by the ND-dominated parliament resulting from the 17 November 1974 election and following the definitive abolition of the Greek monarchy in the 8 December 1974 referendum, with 206 votes on the first ballot. Jurist and multiple cabinet minister with the National Radical Union and New Democracy. Elected by the 1974 Parliament on the first ballot with 210 votes against Panagiotis Kanellopoulos. Prime Minister as leader of the National Radical Union in 1955–1963 and again as leader of New Democracy since 1974. Supported by ND, KODISO and KKE Interior, he was elected by the ND-dominated 1977 parliament on the third ballot with 183 votes against seven other candidates put forward by minor parties. Resigned before the end of his term due to his falling out with Andreas Papandreou and PASOK's decision not to support him for a second term in 1985. PASOK MP and Speaker of Parliament, he substituted for Karamanlis following his early resignation. Jurist, famous for his role in investigating the Lambrakis assassination. He was supported by PASOK and KKE, and was elected unopposed by the PASOK-dominated 1981 Parliament on the third ballot with 180 votes. The November 1989 Parliament failed to elect a President after three ballots, with the votes of PASOK being split between incumbent Christos Sartzetakis and Ioannis Alevras, leading to its dissolution and snap elections. Karamanlis did not present himself as a candidate during the first three ballots, but was put forward by New Democracy after the elections. He was elected by the new 1990 Parliament on the fifth ballot with 153 votes, opposed by PASOK-sponsored Ioannis Alevras and Konstantinos Despotopoulos (Synaspismos). National Radical Union and New Democracy MP and cabinet minister, after 1985 leader of the breakaway Democratic Renewal party. Supported by PASOK and Political Spring, he was elected by the PASOK-dominated 1993 Parliament on the third ballot with 181 votes, against ND's candidate Athanasios Tsaldaris [el]. His re-election in 2000 was by the PASOK-dominated 1996 Parliament, as a joint candidate of PASOK and ND, standing against Synaspismos' Leonidas Kyrkos. PASOK MP and multiple cabinet minister. He was elected unopposed for his first term by the New Democracy-dominated 2004 Parliament as a joint candidate of ND and PASOK on the first ballot with 279 votes. Re-elected unopposed for a second term in 2010 by the PASOK-dominated 2009 Parliament as a joint candidate of PASOK, ND and LAOS on the first ballot with 266 votes. New Democracy MP and multiple cabinet minister. The previous ND-PASOK coalition failed to elect Stavros Dimas on the first three rounds, leading to new elections, which were won by SYRIZA. Supported by SYRIZA, ANEL and ND, Pavlopoulos was elected by the new 2015 Parliament on the fourth ballot with 233 votes, opposed by the candidate of The River and PASOK Nikos Alivizatos. ^ Κούρεμα 50% στο μισθό του Προέδρου της Δημοκρατίας (in Greek). protothema.gr. 14 September 2012. ^ a b c "President: Election of the President". Presidency of the Hellenic Republic. Retrieved 17 February 2015. This page was last edited on 27 March 2019, at 01:51 (UTC).